I have visited Waraku Japanese Restaurant in Bandar Baru Medan Ipoh (the area near to Jusco Kinta City and Tesco if you’re scratching your head there) many times before. Yet I have not written about this place, run by a Japanese lady who’s pleasant and affable. Waraku has been gracing the Japanese cuisine scene in Ipoh for at least 3 or so years, occupying the lot previously named Jyu Restaurant. 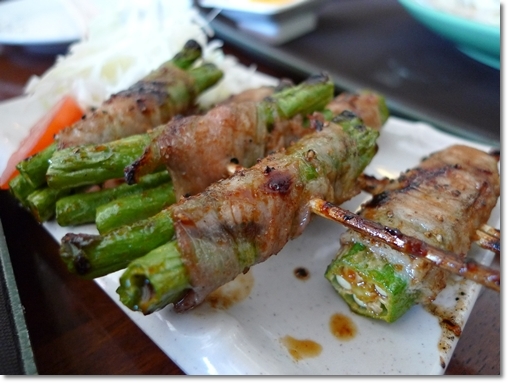 Waraku takes great pride in their extensive array of Kushiyaki, or grilled meats and vegetables on sticks. Previously it was either the photos turned out pretty bad (from a friend’s camera, and some from my old, trustworthy Nokia 5610) due to the dim lighting inside of the restaurant, or I was neglecting the backlogs and completely forgot about Waraku. Until we visited Waraku again and again, for the reasonable RM15 Set Lunch Promotion. I am not sure whether this promotion is still going on, but the last we went, about two months or so ago, the sets were still priced as such. Brings back memories huh? This shot was taken with my camphone. So this has to be at least more than a year’s old. Aside from the lunch sets, which numbered an astonishing 20 choices; from Chirashi Zushi to Gyudon, as well as sets with ramen, udon and soba. Although not every single set is your idea of mind-bogglingly delicious, there are some gems paired perfectly here and there. For instance the Chirashi Zushi set came with thick cuts of raw fishes, while some sets come with Waraku’s signature grilled meats on skewers (Kushiyaki). The Sake Kodon Yaki Tori Set is another good choice, for you’re served with four thick slices of fresh salmon on rice, potato salad, miso soup, and two skewers of random items, depending on whatever they have that particular afternoon. Or of course, you can ask before hand, if say, you have an aversion to beef, or pork. The Menu with all 20 choices. Complete with pictures of the sets, hence you can point away without wondering what in the blue hell is a Gomuku Yaki Soba, or Chige Nabe. 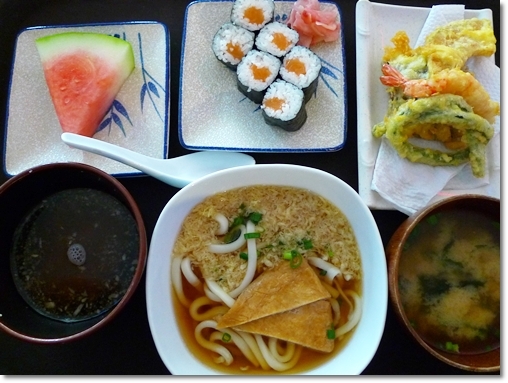 Other notable sets include the Yaki Soba Kushi Yaki Set, with a generous serving of fried soba noodles (almost like a version of Chinese vegetarian fried noodles) and two sticks of grilled skewered meats, and the Sake Chahan Sanbe Temaki Set, a temaki roll of salmon served with fried rice instead of the usual white variety. 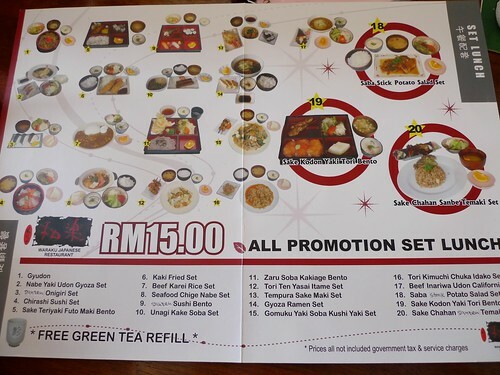 All sets come with FREE unlimited green tea, served either hot or cold, and cuts of fresh fruits. The Sake Kodon Yaki Tori Set – Though sometimes, you don’t exactly get grilled chicken in skewers, but quail eggs, bacon wrapped long beans, etc. Taken with a friend’s Sony Cybershot, under very dim lighting. Pardon the quality, but the Kushi Yaki at Waraku is no doubt the BEST Ipoh has to offer. Really. Of course, if you’re going for the ala carte items, you’ll have to pay a little more. If you do, do try their 30 varieties or so of grilled items on skewers, ranging from my personal favourite of inoki mushrooms wrapped with a slice of pork bacon. Delicious I tell you! And you can have Salmon Belly, beef, lamb or pork, as well as many other interesting combination. Maybe it’s the sauce, but you can go crazy with your orders, for you’re bound to score at least one of your preferred skewer. Not that pricey either, for as far as I can remember, the skewers go for about RM2/USD0.50 onwards, and nothing priced above RM5/USD1.40. Correct me if I’m wrong though. They serve fresh oysters, as well as oysters baked with cheese. We chose the latter, as we were all die-hard fans of cheese. Without the shells, the rather large pieces of erm …aphrodisiac wonders? were a delight to bite into. The decadently creamy cheese was baked until golden brown, and we ended up scooping the cheese into our mouths with relish. The other items we have tried are garlic fried rice, cheese omelette, Tendon (rice with toppings), fried Japanese noodles (udon and soba), some starters, and the likes. 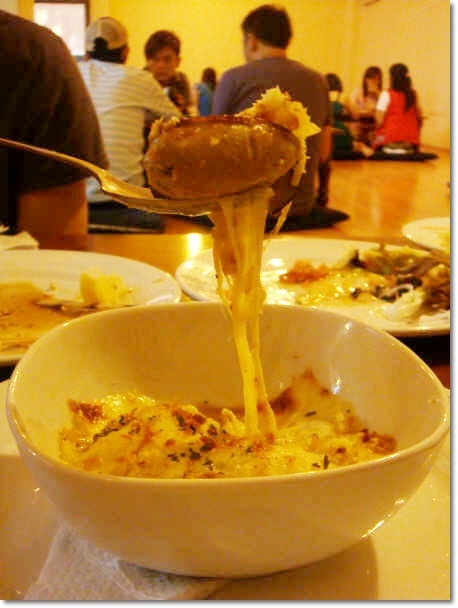 It has been almost two years since that dinner, hence pardon my usual amnesiac attacks. They do catering as well, on top of serving lunch and dinner daily. The number of Japanese restaurants in Ipoh is not exactly impressive, numbering at most in the tens or twenties. But Waraku may be the only one in Ipoh run by a Japanese proprietor. Correct me if I’m wrong though. But I have seen Japanese expats dining here before. Business hours : 12-3pm, 6-11pm. Click for a GOOGLE MAP to Waraku. I must look for this too.. how come there are so many places i have yet to know… there is one tomi japanese food too, just opposite the tesco parking space.. Yes, claire. I have eaten there a few times before. 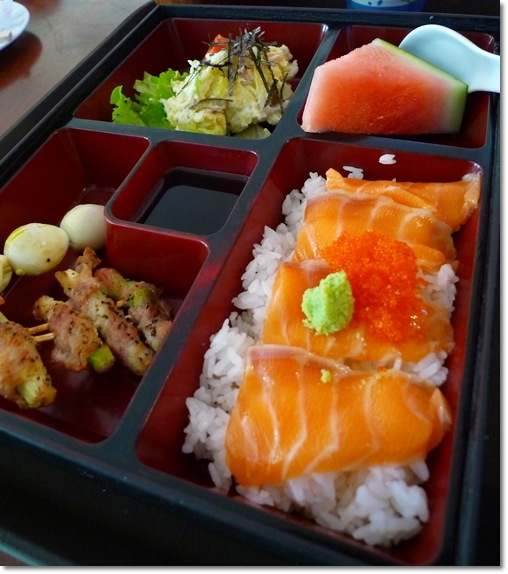 Not bad, especially their bento sets which actually came with fresh, thick slices of sashimi. But then again, some have complained about the food there. I *heart* Japanese food – not tried Kushiyaki before though, but I am great lover of all things grilled too, so let me have at them delectable sticks! I am sure you guys in KL are blessed with even more choices! can this sustain in Ipoh market??? No problem NKOTB, for this place has been running for a good many years, and I see no problem for this to thrive. My son will like it sitting on the floor. Food is extremely cheap compaqre to Penang standard. I will continue reading your back dated article, btw, have you been to Siang Seng seafood in Pantai Remis? The have nice turtle soup and deep fried ginger squirrel.Keep up the good work. The ala carte menu is priced slightly higher though, but still nothing exorbitant. Even the sashimi and sushi are reasonably priced, nothing near to anything resembling a cardiac arrest jolt. finally u did a review on waraku. 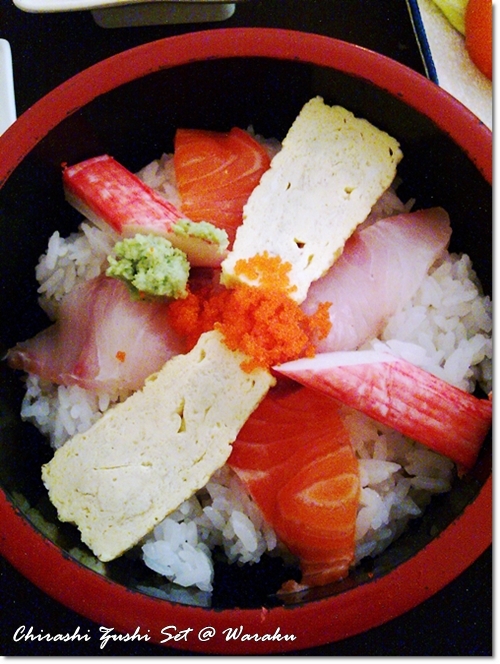 the only japanese restaurant in ipoh worth some mentioning. have been faithfully following this japanese lady from greentown to the current place. Hi amelie, yeah, timely huh? Hahaha, you’re indeed a loyal fan of Waraku’s ya? Indeed they serve one of the better version of Jap cuisine here in Ipoh. Of course, I highly doubt that people come to Ipoh for the foreign cuisines, rather than the hawker food. You mean Tengood in Greentown? Because this is the first time I am hearing about The Good Greentown. Or is it a new Japanese restaurant there? 2 weeks ago i was searching for this Waraku thru cousin’s recommendation that they served lunch set..
Too bad went round & round & couldn’t find it so end up at A Lai I Japanese restaurant.. Not bad their bento set.. Saw another new Ten Good Jap restaurant but opening date is set on 21/4.. Hv try the Ten Good at GBC, not bad, too!.. I js happen to read ur article on Sunday’s Star.. Din noe here was such a wonderful food site on Ipoh/Perak foods..
Btw i luv 2 eat..
Oh, Waraku is just beside the overhead expressway, before you enter Ipoh Garden East. A corner lot, opposite of Voodoo. This is not the same waraku restaurant franchise that served pasta and pizza? Selba, it’s different. 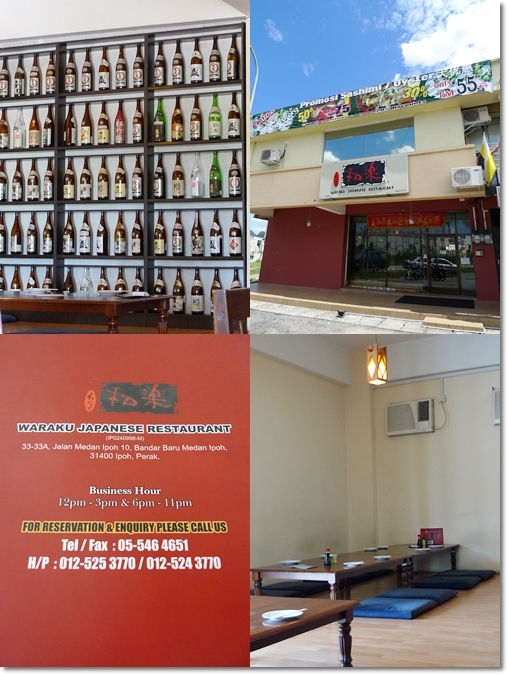 This Waraku in Ipoh serves only authentic Japanese food, and has no branches. Set lunch promotion is from 12noon till 3pm but most are sold out especially those with salmon. Ala carte items are pricey and small very small portions. They ran out of salmon on Sunday! Sold out? I have not experienced that, so far at Waraku though. 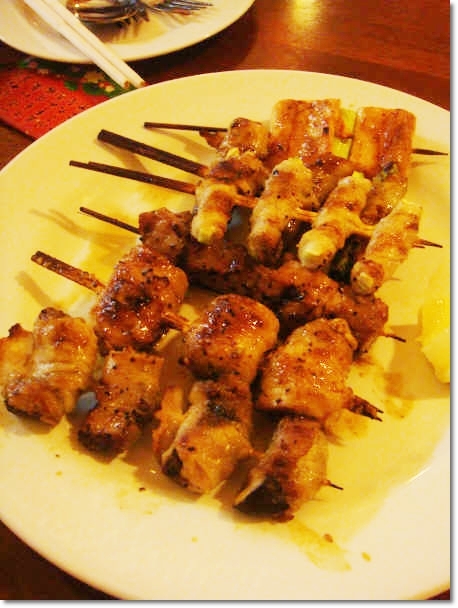 Personally I find that their grilled meats on sticks are rather tasty, don’t you think so? love your comments, but could you please state in future reviews stuff like if it serves pork or not? i am malay and have to be kinda careful. especially looking for non-lard/pork dimsum outlets here in perak. i know they have it in hotels in KL, and i had some gorgeous halal dimsum in hong kong. Can you help a girl out? Thanks! this means it’s either NOT halal, or I’m not sure bout the status. I am planning to do a list on Halal Food in Ipoh, wait for it k? As for halal dim sum outlets, so far I have no idea. Maybe Royal China next to Casuarina, but I vaguely remember about Tai Thong Dim Sum serving pork (this was many yrs ago) hence I doubt Royal China’s halal as well. I’m sad to report a rather disappointing visit. The skewers were a huge let down, particularly the grilled scallops. RM8 for 3 pathetic pieces that were almost charred beyond recognition! The lunch sets were only so-so. The chawanmushi had an odd taste to it. Only the soba was outstanding. For a while, ours was the only table occupied, so the staff hovered over us! Attentive service is all well & good but it should not be at the expense of customers feeling uncomfortable. When another group of customers arrived, the service went to the other extreme, where it was even difficult to ask for the bill! 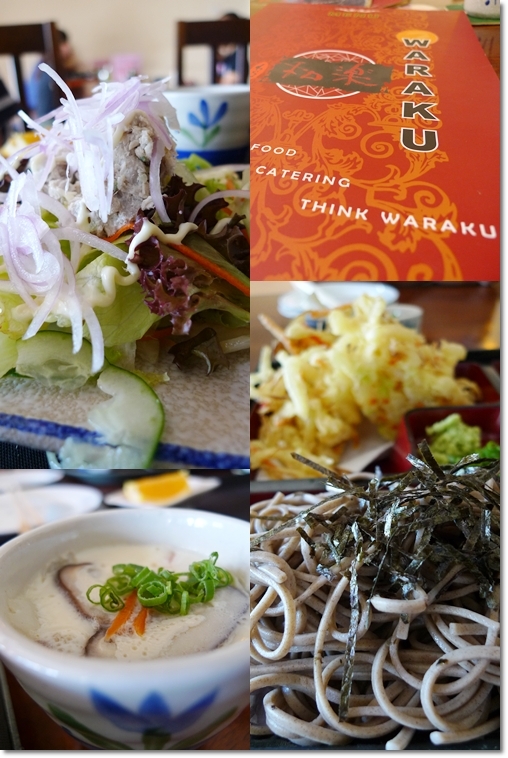 Sigh… I really wanted this to be a fantastic food experience but I don’t think I’ll be visiting Waraku ever again. I’m Japanese.When we live in Ipoh, We go many times. 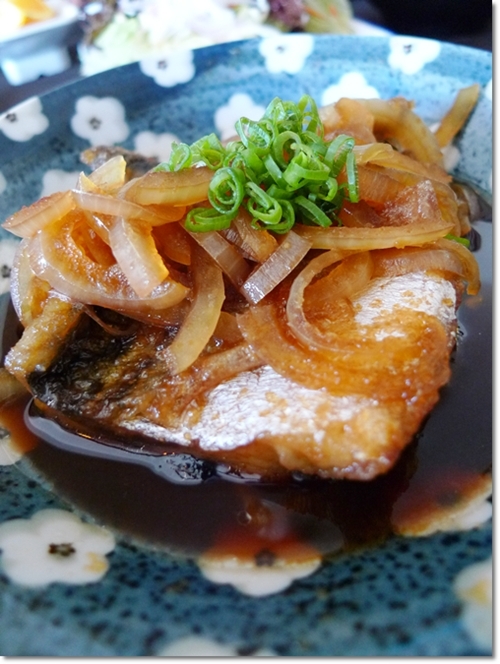 Dishes, beverages and hospitality are one of the best Japanese restaurant in Ipoh. There are Japanese and nice staffs. So you’ll be satisfied.I give guarantee. Let’s go! Never go to this restaurant. We Made a reservation and went there for dinner, and they can actually tell us they don’t have sashimi or seafood till Friday,when their supply arrives. They should inform us when we made the reservation. Worst part was we wanted to leave as they didn’t have salmon also,and they got the cheek to charge us for the tea,which we hardly touched when their service is so lousy.